“Rather than believe that Watson and Crick made the DNA structure, I would rather stress that the structure made Watson and Crick”. “DNA was more important than evolution”. In Crick’s view, their work on the structure of the DNA molecule was important because it confirmed, on the molecular level, Darwin’s evolution theory. It is true that DNA in living things made natural selection (and evolution) possible—but Watson did not create DNA. Furthermore, without the guiding principles of Darwin’s theory, I doubt if Crick and Watson could have solved the DNA structure as they did. Eric Kandel, the Nobel neurobiologist, calls Crick “perhaps the most creative biologist in the second half of the twentieth century”, who “spent the last several decades of his career studying the marvels of conscious visual perception” * (See here my post on Crick). James Watson apparently thinks so—to the dismay of his many colleagues. But there is a simple explanation: his thinking has not evolved since 1953, when DNA structure was discovered—the moment of glory that he so craves. Gene, heredity, and eugenics dominated the first half of 20th century politics: the Nazi genocide and the opposing extreme of Stalin’s Russian hoax: that food plants (and humans) could be made super-productive and pass on the trait. Many biologists who did not hold that view went to prison. Some died there. In the documentary Decoding Watson (PBS, 2018), the director saw a King Lear in Watson’s apparent character failings. But accentuating the drama in story-telling brings up the question of scientific truth-telling—intended or not—in a documentary. Cutting and pasting clips of interviews from prominent biologists to form one long sentence seems clever. But it risks feeding the impression (to a general public) that DNA is the most important, if not the only one in heredity—when all the words chosen are spoken to that effect, away from context. In the same way, Watson’s own conviction in the universal truthfulness of his personal experiences, and a refusal to see things as they relate to each other, confirms his own DNA doctrine—thereby his sexist and racist remarks. Environment or DNA? In a recent study based on a massive database of insurance claims from certain zip codes over a period of several years, a Harvard team was able to examine 56,000 pairs of twins and their propensity to certain diseases. This is the largest twin studies to date. It has long been known that children from poor neighborhoods face challenges in their learning outcome—oftentimes they are simply hungry. Of course, malnutrition contributes to poor memory formation, which requires protein synthesis. But how do we find reliable data to support such claims? And how much of it is genetic? Twin studies provide a good window. One surprising finding in the study is that socioeconomic status and air quality have less influence than genes and shared surrounding: lifestyle and neighborhood [most people who share a household are genetically related]. This makes sense: our cultural habits are more entrenched than external factors like climate or temperature (to which our body adapts). The study finds 40% of the diseases (out of 560) have a genetic component. But eye diseases top the list as the ones with highest environmental influence while “Cognitive disorders demonstrated the greatest degree of heritability—four out of five diseases showing a genetic component…”. Are there any environmental correlations between cognitive diseases and eye diseases? There are many well-known environmental factors which are heritable to one or many generations: fetal alcohol syndrome (FAS) has been known since Greek and Roman times and inspired the 18th century British artist William Hogarth to make Gin Lane, showing its tragic consequences on the urban poor and their children. This sort of extended heredity apart from nuclear DNA in the fertilized egg is now an important field of study. It includes the relatively new discipline of epigenetics, which uses molecular tools to study how some genes on the DNA are turned on or off, and how such sequences may vary with changing micro-environments. 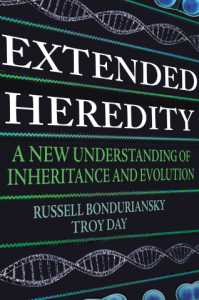 Extended Heredity: A New Understanding of Inheritance and Evolution (2018) from Princeton University Press is a timely book (see here my review in Leonardo Reviews). 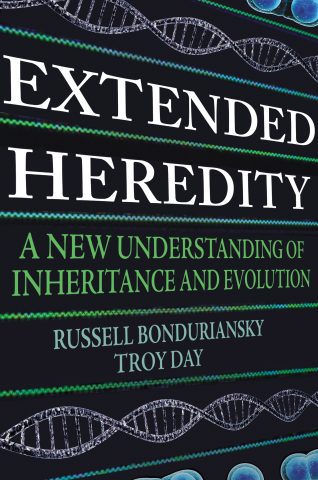 It elucidates the many aspects of inheritance beyond the DNA molecule, in organisms from bacteria to humans. Here, bacteria, not humans, are the important players—because microbes far exceed humans in numbers. They were originally responsible for producing the gases that made Earth habitable—thus the evolution of animals and plants 580 million years ago. With their rather naked DNA and high mutability, microbes are almost impossible to control once their delicate group energy balance is disturbed. In our eagerness to win the race, to control them, they could turn against us and make Earth uninhabitable one again (See my post here). Perhaps, knowing what we know now about DNA and inheritance, we could be more understanding of Watson, a once-fine scientist who could not keep up with current reality: he is not alone in our world today. And perhaps proving that scientists fail too, occasionally, bowing to human hubris. Watson’s overriding passion to “win”, to be “big” proves his downfall.